If you’re like me, you are always looking for a meaningful gift for your friend or loved one that seems to have everything. Well, I have the perfect gift idea . . . at least for that special baker in your life. As you may know, I posted a tutorial on how to make your own vanilla extract using the many varieties of vanilla beans that Beanilla has to offer. It is a simple, yet necessary project for those of you that enjoy the taste of true vanilla extract and know that there is no substitute. For the holidays, Beanilla and My Baking Addiction wanted to provide our readers with a simple solution to your gift giving woes. Beanilla conveniently offers an amazing variety of quality vanilla beans and also stocks a fabulous selection of glass bottles for your vanilla extract bottling needs. 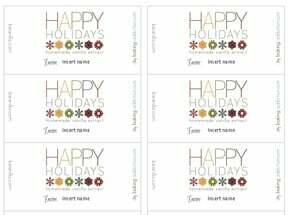 As an added bonus, the graphic designer for My Baking Addiction created holiday labels that can be downloaded and personalized. 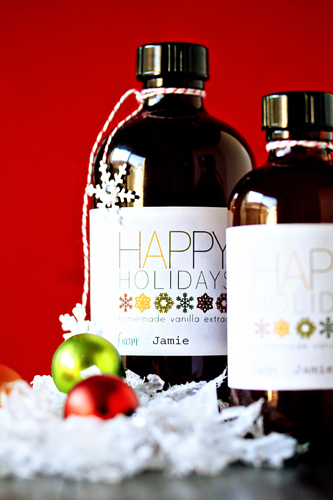 We jazzed up a simple Avery shipping label to create a unique and festive way to personalize your bottles of homemade vanilla extract. Add a holiday ribbon to the neck of your bottles and no wrapping is needed. So, head over to Beanilla, purchase your bottles, download your labels and I am betting you can cross a few people off of your list. Stay tuned for a few more handmade gift ideas with corresponding labels in the upcoming weeks! this is a beautiful gift idea…i’m falling more and more in love with the thought of creating gifts rather than buying them this year! Love the idea but your tutorial says 6-8 weeks – Christmas is only 3! Wish I would have gotten started earlier, guess I’ll have to try to remember this for next year. Love the idea though. I am thinking you could still pull this off! When you bottle it to give as a gift, simply add in a bean or two to each bottle. I love making things as Christmas presents as opposed to purchasing and this is a fantastic idea! I am glad to hear that with a shorter time frame that this could still work. What a great idea! I love it!!! I’m heading straight over to Beanilla! Thanks!!! Love the labels!!! So cute! What a great idea!!! Absolutely adorable. :) Now I need to go back and figure out how much lead time I’ll need to make the extract. What a lovely gift idea! The bottles make it look so professional and the labels are adorable. Jamie,what a wonderful post-thank you so much for sharing and putting all this together. Where can I purchase the snowflakes attached to the red & white twine? What an amazing gift. Nothing better than giving something you made yourself. I love the pretty presentation! Wish I had time to do this for Christmas, but just thinking what a lovely wedding favor this would be, too. So nicely done. How do you download the labels? absolutely beautiful! love the amber bottle. GREAT idea! Thanks for the template! I made vanilla to give for Christmas this year. I am happy to see your post and that you shared your labels. Thank you so much for the cute label!! My vanilla bottles look great! I too gave these out for Christmas presents this year, and bought all my supplies from Beanilla. Such a great website! And your labels were perfect, thank you for the idea!! We visited the Hawaiian Vanilla Company in Hawaii and learned how to make vanilla there. Love the idea of giving this as a gift. Love your site too. I am glad to hear you are enjoying the site and the vanilla labels! Have a great day – thanks so much for stopping by. Is there a way to make the labels smaller? I’m not aware of a way to do this, but it might be a question for the printing shop of a store like Office Max or Office Depot. I hope this helps!